Can you really trust a guy with hair like this? Gottfried Wilhelm Leibniz is a fool. That’s the only explanation for theodicy, the inane, laughable idea that he came up with to rationally prove that his version of God was real and all-powerful. Leibniz, for those of you who have lives and don’t spend your afternoons reading philosophical nonsense, came up with the idea that our world must be “the best of all possible worlds”. I believe that his “best of all possible worlds” hypothesis is in a category by itself in the pantheon of truly moronic thoughts. If I had to argue what the dumbest idea in history is, this is my vote. Now, I’m sure some of you have an crazy uncles who have theories that link vampires and global warming or think that the phone company had John F Kennedy killed, but I am speaking of ideas that have been taken seriously by a good number of people. Leibniz was and is a highly respected thinker. As a matter of fact, he is one of the most significant and respected minds of his era. They named a cookie after him in Germany for God sakes. Granted, many great philosophers have had dumb ideas. Descartes had some pretty blockheaded ones and he was certainly no slouch. The guy ran around dissecting corpses because he believed that the soul was physically located somewhere inside of their skulls. God’s very own set of rabbit ears, I guess. 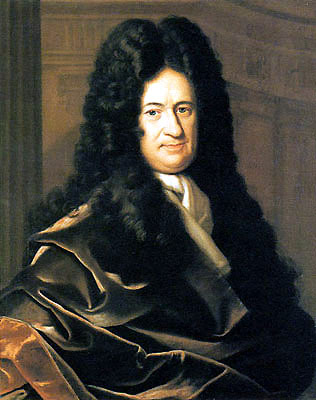 Leibniz, however, took intellectual goofiness to new heights. Voltaire used the better part of his book Candide ridiculing Leibniz by portraying him as the doltish Dr. Pangloss. No matter what horrible bit of suffering affected his view that “all is for the best in this best of all worlds”. Voltaire clearly and succinctly put this idea out of its misery, but for an idea this horrendous, there are simply not enough nails for the coffin. Leibniz begins this monstrous theory with the idea that God is perfect. This is a completely unprovable assumption. How would Leibniz know if God is perfect? Has he seen another world that God has created and compared the two? Has he evaluated each an every atom in the universe and found no mistakes? Who is he to even think he can judge the work of the creator of the universe? How does he even know for certain if there is a God? If Leibniz wants to say that he has faith that this is true, that’s fine with me. He can have any spiritual belief he wants. But that is not what he’s saying. He’s trying to make the assertion that his belief can be rationally proven. He gets no leeway here because he’s trying to smuggle his spiritual beliefs into the world of rationality. Just so we can get to the silliness that comes next, let’s take him at his word about the God being perfect thing. This perfect God had a choice of every possible universe. He looked at each, evaluated it and came up with the perfect one. Why you ask? Because he’s perfect and is incapable of choosing a less than perfect world. If he’s perfect and has the choice of any possible universe, what makes Leibniz so certain he would choose the perfect one? Leibniz is making the mistake of trying to assume what the thinking of a perfect being would be. Again, how would Leibniz know what God would choose? Maybe God wanted to experiment to see what an imperfect world would look like if it played out for a few hundred thousand years. Maybe God just picked at random. I don’t know what happened and neither does Leibniz. So, he’s 0 for 2 so far with two strikeouts, but he isn’t going to stop there. Now, he’s going to take his perfectly unprovable God who picked this unproveably perfect universe and pull the proverbial rug out from under him. See…cuz…this perfect being, right, he only had a choice of lots of imperfect worlds and he chose the best one he could find. So basically, God, the perfect being, is unable to go shopping at say, Macy’s, and instead has to pick potential universes out of the 9-dollar pile at TJ Maxx. He couldn’t pick a universe where people lived forever and there was no suffering, no perception of suffering, no cancer, no starvation, no bubonic plague, an infinite amount of space, resources and joy. All of those were out of stock or on back order. He had a choice between lots of different universes that happened to have all sorts of design flaws. No new Mercedes for you, God! Its either the 1998 used Saturn with no working radio or heat or the 1975 light blue Pinto with the flaming engine. Leibniz rests a highly questionable conclusion on top of a mountain of conjecture. Does Leibniz mean to say that God should get credit for the good things in the universe but bare no responsibility for the bad? If you only have control of some facets of the universe, then how can you be called omnipotent? You could drive an 18-wheel cement truck through the holes in this argument and still have room for the University of Michigan football team and the cast of a Robert Altman film. The only thing that Leibniz’ argument actually proves is that Leibniz believes in God. I have no call to hassle the man if he simply wants to make the point that he doesn’t know why, he just believes in God. I have a good deal of respect for people of faith, because they are able to believe in something they can’t exactly explain but feel deeply. An argument for the existence of God based on belief or faith can be a powerful and beautiful thing. Arguing for God based on quasi-rational statements that are filled with highly speculative “proof” is at best slightly insane and at worst highly disingenuous. This entry was posted on December 25, 2010, 11:31 AM and is filed under Existential Rambings. You can follow any responses to this entry through RSS 2.0. You can leave a response, or trackback from your own site. One other glaring fault in his -rational- is that he failed to define exactly what “perfect” is. I think that is a direct result of him not properly defining what he means by perfect in this context. Maybe the idea that ‘this is the best of all possible worlds’ translates metaphysically into ‘every moment is exactly as it should be.’ This latter statement leaves out the perception and judgment of ‘best’ or ‘perfect’ – it simply states ‘what is.’ The perceptual lens through which we view the world add on the layers of judgment based on perception. After all, what is perfection anyway and who gets to decide? So it really doesn’t matter how Leibniz defines perfection. It is simply an idea with no basis in reality. Words like ‘best’ or ‘perfect’ are only adjectives and there can be no certain validation of applied adjectives as truth. The words we use to describe our view of the world are always subjective. Be that as it may, if he’s going to write about it so much, he should at least try to define it. Papers and books have been written trying to define one word. He could have made an effort. He certainly gets himself into a great deal of trouble with the word perfect. The minute he tried to define it he was in for a world of problems. If he pins the word to a physical thing it diminishes his God. For example, if he said God was as perfect as a sunset, he has now limited the scope of God to one possible experience or vision. God must be more than a sunset to be perfect, right? But, if he doesn’t define it, it’s left to the audience to insert their own view of perfect. This is pretty sneaky if you ask me. By not defining it, it can be anything. The point of a rational argument is to create a system of thought that will apply under all circumstances. The use of this term could certainly be thought of as a bit of sophistic sleight of hand. It’s a similar dilemma to what Robert Pirisg’s Pheadrus character faces when he comes to the task of defining quality. If it’s “anything you like”, then it doesn’t mean anything and if you define it, you may not really have anything there. Leibniz seemed pretty comfortable tagging an abstract idea with an equally abstract term and calling it a day. I am glad you both hit on this idea. I wish I had thought to include this part in the original article because it’s another major issue he neglects to deal with effectively. …And of course, there is the other problem of Leibniz anthropomorphizing God, which just opens up another can of worms – the idea of duality or separateness. Got that right! I see where you are going with this one and we’ll be getting to your boy Descartes in another post. I got somethin’ for him and his mind/body nonsense! Quite right, Keith. There is faith and there is reason. The two are as oil and water. Your post is well-written. As a youth and young man I was infected with a severe case of confirmation bias, accepting that God must have some mysterious motive for how He configured the world and its inhabitants. Having now attained 73 years of life experience I have different conclusions. God either does not interfere, or He is cruel. Churches collapse on congregations. Natural disasters abound: tsunami’s, earthquakes, volcanic eruptions, mudslides and the like all affect the good and the evil alike. Then there are the diseases, including genetic errors almost too horrible to contemplate. Retardation, cleft palate, retinoblastoma, elephantiasis, etc. If He does interfere with what happens on our little blue marble, then He is like a child with an ant farm, observing our reactions to the unpredictable. Not a nice image. Then there is the reality of evolution. The fossil record is real and consistent. It has gaps, but those are being filled in with regularity now and the evidence is consistent with DNA evidence. Scientists have even confirmed the diaspora out of Africa in several stages. We evolved. We were almost extinct about 10,000 years ago, as I have previously posted. All of this belies the childish biblical account in Genesis and the enormous number of contradictions in the bible. The clerics say that the mind of God is unknowable and that we therefore must not question His motives. But, if God made man in His image, complete with awareness of self and of our own mortality, did He not endow us with not only the capability but the compulsion to question? Thus I conclude that He is either cruel, disengaged or non-existent. How many angels can dance on the head of a pin? Let the debate begin again, but I have other things to do. BTW, Happy Holidays to all. Just because God is disengaged doesn’t mean we can’t be nice to each other. Fantastic reply, Jim. You have an excellent perspective on this. I like the options of disengaged and non-existent (if I had a choice, which, of course, I don’t). The cruel, ant farm owning landlord model is a horrifying idea. I am really starting to come to terms with the fact that I am never going to rationally understand the whole thing. I don’t think it can be reasoned. I tend to think the mind, motives, existence, and actions of God are pretty much unknowable. I am okay with that. I think the certainty many people seem to have about God’s motives are what has gotten us in a good deal of trouble. I think your conclusion is correct. Whatever God is or isn’t, we have the ability to act with compassion towards one another. That is what matters. Hope you are having wonderful holiday as well! So he didn’t come upwith those Choco Biscuits then? Nope. Those things are pretty good though! Sounds like a lot of our governments. They pat themselves on the back for the “good things” (put in quotations because, of course, good is relative) but will deny that they do any bad things. Ain’t that the truth. It’s like the old expression goes “Don’t take credit for the sun if you don’t want to get blamed for the rain”.